Climate change has forced Santa out of North Pole. Rumor has it that the toy man is moving to Canada. "Climate change has forced Santa to pack up his sleigh and find a new home," David Suzuki said, reporting live from the North Pole. 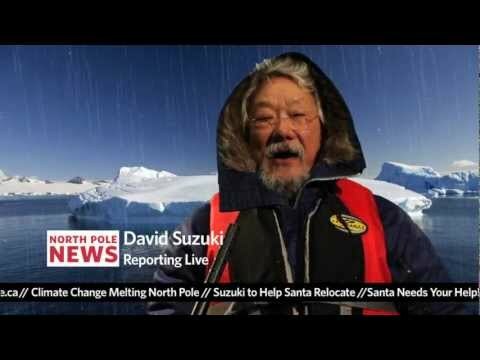 Turns out, Santa asked environmental hero Suzuki to help him relocate until the issues of climate change can be addressed. Now, Suzuki is helping him find a temporary workshop in Canada. But Santa needs your help too. Suzuki has launched a "Where will Santa live?" campaign. And while the campaign is "lighthearted," the release warns that there is "a sobering reality behind this advocacy." The campaign hopes to encourage people to think about climate change, and what it can do to Canada's winter. "The fact is that climate change is threatening the future of winter in Canada. As a lover of nature, David Suzuki is deeply concerned many of our beloved winter pastimes are at risk," the news release read. Help support David Suzuki Foundation’s efforts to protect the Canadian environment and turn back climate change here.